A gentle, easy to rinse facial scrub with the power of 1000 Micro-Beads+ & Pure Lemon Extract to intensively cleanse & visibly brighten skin - 1 tone fairer in 1 wash. Suitable for everyday use. To use: gently message on wet face (avoid eye area), lather and rinse with water. I have nothing much to say about the packaging since it's pretty much the usual and common packaging for facial wash. Only, this wasn't sealed. 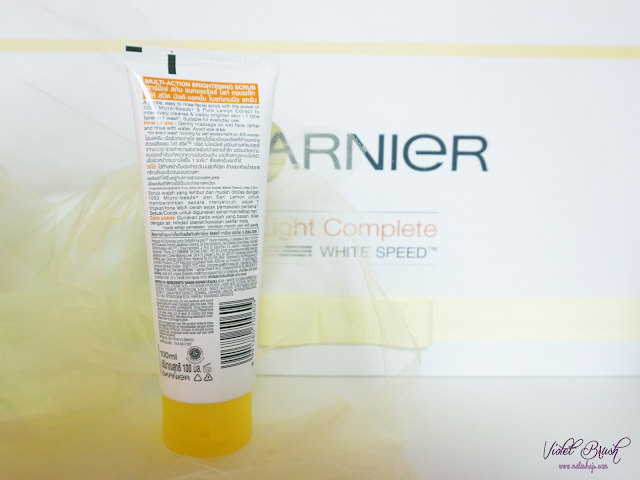 Although the outer box is sealed, I still prefer the tube to be sealed also. 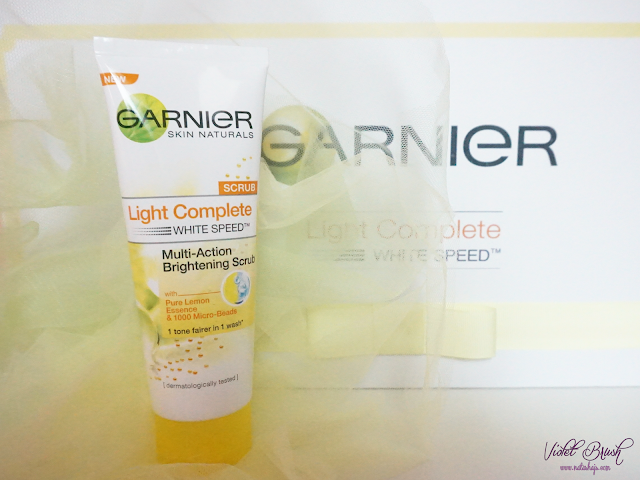 Garnier's Light Complete White Speed Multi-Action Brightening Scrub has not-too-thick yet not-too-light consistency. 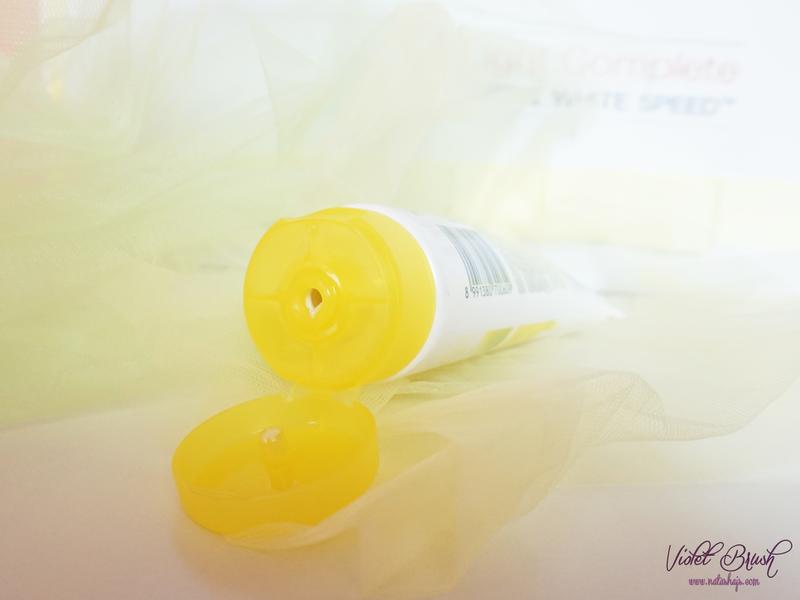 It contains small scrub particles which is very gentle on the skin thus it's okay to use this everyday. Speaking of scent, it has fresh lemon scent that makes me feel fresh after washing my face. Although on me it wasn't 1 tone fairer after 1 wash, I could say that Garnier's Light Complete White Speed Multi-Action Brightening Scrub brightens up my face after 1 wash. However, during the one week I was using this product, I couldn't see any other progress. Perhaps, it's because my skin is fair enough. This scrub is formulated for oily skin and probably that's why after wash my skin would feel very tight and sometimes dry, even though I have quite oily T-zone. These days, my skin is more to normal to dry rather than normal to oily. Therefore, I would love to use this as weekly scrubbing routines rather than daily facial wash. It feels dry on my skin. But I would love to try the brightening foam, though. Bener banget Nath, yang foam aja ketat banget apalagi yang ini..
really helpful information written by you for girls. Can this be used everyday? Like 2x a day?